The cost of energy seems to always be going up. Even if you practice avoiding lifestyle creep, it still finds its way into your daily life through the purchasing of groceries to your cable and electric bill. 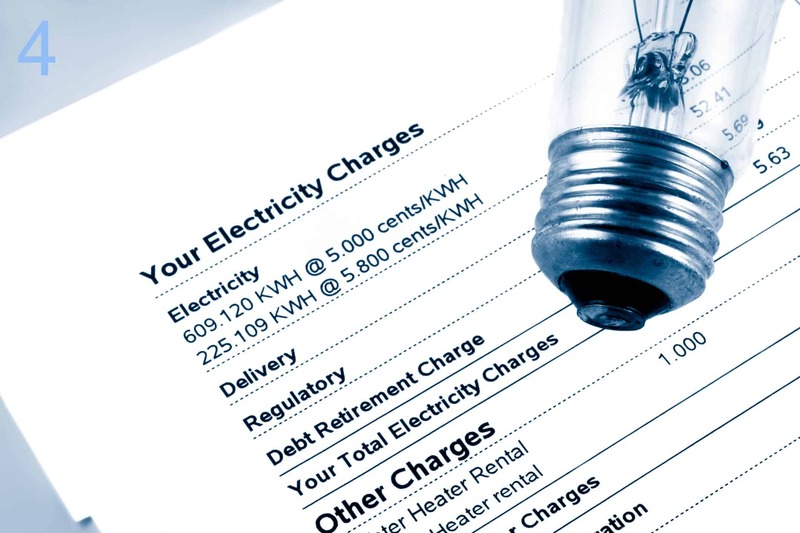 Below, I outline four easy things you can do to help reduce your electric bill. While you cannot stop the cost of electricity from rising, you can take measures to make certain that you aren’t throwing money out the window. It’s nice to open up the dishwasher and pull out freshly clean and dry dishes. But have you ever stopped to think about how much this costs you? If you are like me, you only run the dishwasher when it is full so that you aren’t wasting all of that water. But you probably haven’t thought about the auto-dry feature. Personally, I open the dishwasher and let them air dry- aka the lazy man method. Opening the door speeds up the drying time since the air can move freely in and out of the dishwasher instead of being trapped inside. Many times we heat and cool rooms we hardly use. In my house, that would be the guest bedroom. It rarely is used unless someone is coming over to stay the night. So why do I heat and cool it? I’ve since closed the vent in this room to almost completely closed. It doesn’t get very hot in there in the summer, nor cold in the winter. I do open it back up when I have guests arrive. Similarly, I close the vent in the bathroom as well. This is a small bathroom and the door stays open so the warmer air in the winter gets mixed in that room. No point in heating or cooling it since it stays at a consistent temperature otherwise. I use a power strip for my electronics in the living room. I plug the TV, DVD player, surround sound system and video game consoles into it. I plug the cable box directly into the wall. When I leave for work or I head up to bed, I flip the switch on the power strip to off. The reason I do this is because of phantom power. Even though my video game console and my surround sound system are off, they still draw power. By turning off the power strip, it cuts all power so they cannot continue to draw electricity. Since I have a DVR and record shows, I leave that plugged into the wall so that it can still turn on when there is a scheduled program to record. It might sound crazy, but I’ve seen a nice drop in my monthly electric bill since I began doing this. This is easier to do in the winter than the summer. Simply run your hand around all of your window trim. Chances are you will feel a cold breeze. If you do, pull out the caulk gun and reseal the trim. I’m no Bob Vila and I was able to do all of my windows in about an hour. It really is simple and should be done. Doors on the other hand do take a little bit more time. I ended up installing new seals around my entire door. It was still easy to do; it just took a little bit more time. By sealing up your windows and doors, you are preventing the warm air in your house from escaping and letting the cold air in. Since the inside temperature stays more consistent, the heater works less, saving you money. There are plenty of things you can do to cut down on your electric bill; these are just a few. I chose these because of how easy they are for anyone to complete and will show up as savings on your next electric bill. You should be able to shave a few hundred dollars off of your annual electric bill when you use these tips. That couple hundred dollars would be a nice addition to your retirement account, a vacation, or helping with paying off high interest debt.